↑ Saigol, Rubina (12 May 2010). "Benevolent dictatorships". The Express Tribune. Tribune Express newspapers, Saigol. Tribune Express. Retrieved 7 November 2016. ↑ Story of Pakistan:Editorial. 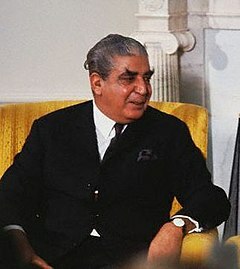 "Yahya Khan". June 1, 2003. Story of Pakistan Foundation. Retrieved 7 January 2012. ↑ Malik, Anas. Political Survival in Pakistan: Beyond Ideology (in ਅੰਗਰੇਜ਼ੀ). Routledge. ISBN 9781136904196. Retrieved 7 November 2016. ↑ Humayun, Arif. Connivance by Silence: How the Majority's Failure to Challenge Politically Motivated [Mis]interpretation of the Qur’an Empowered Radicals to Exploit Islam and Propagate Radicalism (in ਅੰਗਰੇਜ਼ੀ). Xlibris Corporation. ISBN 9781453595725. ↑ Waines, David. An Introduction to Islam (in ਅੰਗਰੇਜ਼ੀ). Cambridge University Press. ISBN 9780521539067. Retrieved 7 November 2016. ↑ Dogra, Wg Cdr C. Deepak. Pakistan: Caught in the Whirlwind (in ਅੰਗਰੇਜ਼ੀ). Lancer Publishers LLC. ISBN 9781940988221. Retrieved 7 November 2016.